I had a friend in college who would wiggle in her chair whenever she was eating something really delicious. As an eater and a cook, I really appreciate that kind of enthusiasm at the table. 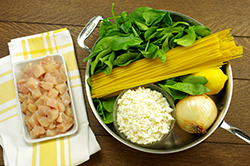 I know Lynn would really love this pasta dish because it’s delicious, quick, and easy to pull together for a busy weeknight meal. 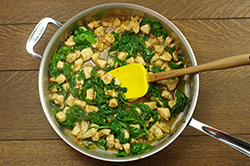 She’d love the tender chicken, chewy pasta, salty cheese, and fresh spinach, which is irresistible by the way. Last but not least, the lemon in this dish is so bright with tart fruit; I know that it would make her smile . . . and wiggle a little bit in her chair. 1. 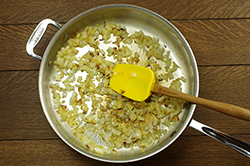 Fill a 12-in./30.5 cm skillet with water up to about 1 in./2.5 cm from the top. Cover and bring to a boil over high heat. Add 2 tsp salt and toss in the linguine. Stir gently once or twice so the noodles don’t stick. Cook, stirring occasionally, until al dente, about 3 minutes or according to the package directions. (To check, fish out a strand and bite into it. It should still be chewy, but not tough.) Scoop out 1/2 cup/120 ml of the pasta-cooking water and set it aside. 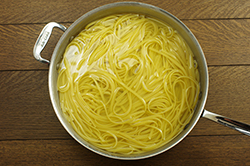 Drain the pasta in a colander set in the sink and run just enough cold water over it to stop the cooking but leave it warm. 2. 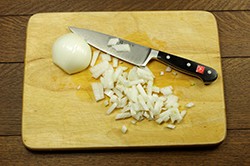 Reduce the heat to medium-high and add the olive oil to the hot pan along with the onion and cook until the onion softens a little, about 2 minutes. 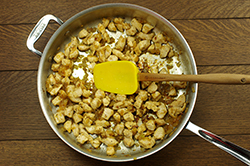 Add the chicken, 1/2 tsp salt, and a sprinkling of pepper and sauté the chicken until it is almost cooked, about 2 minutes. Add a little of the reserved pasta water to clean up any brown bits on the bottom of the pan. 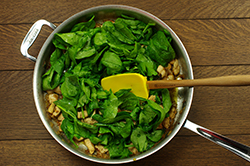 Add the spinach to the pan by the handful and cook, stirring and tossing until it has wilted. 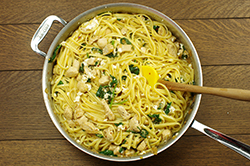 Return the drained pasta to the pan and add the feta cheese and lemon juice. Toss the mixture until the cheese has melted a little and season again with more salt and pepper if it needs it. You might want to add more lemon juice or pasta water as well. It’s up to you. If you like a little heat, a pinch of red pepper flakes is a welcome addition. 3. Mound the pasta onto two heated plates and serve hot. 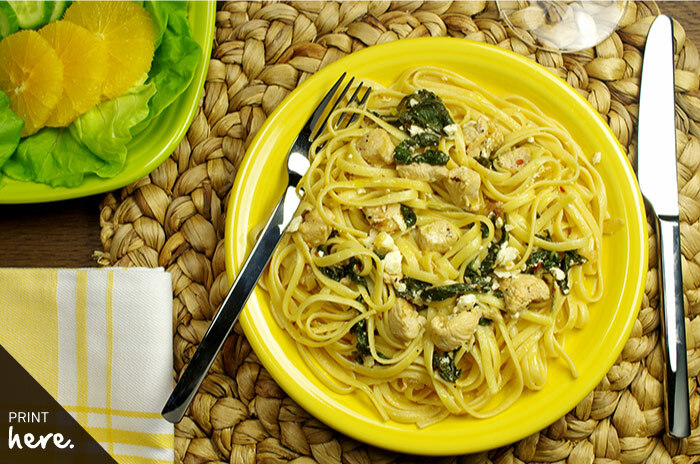 It’s That Easy: This dish is easy for me to pull together because I always have the ingredients on hand; boneless chicken breasts and fresh pasta in the freezer; lemons, feta, and spinach in the fridge; and onions in the pantry. It’s so easy. It really is. Extra Hungry? Add a little green salad of butter lettuce, radicchio, and orange tossed with a glug of olive oil, salt, and lots of pepper. In the Glass: A Beaujolais from Jadot would be my choice with this dish but if you’re looking for white you can’t go wrong with a bottle of Kim Crawford Sauvignon Blanc.